A black and white portrait photograph of Harry Warburton Jermyn. Harry Warburton Jermyn was born at Petrolia, Ontario on June 21, 1903 and until the age of 11 lived in Penticton, British Columbia. He came to Whitby in 1914 and after graduating from the University of Toronto and the North Bay Normal School he became a school teacher in northern Ontario. From 1930-1932 he was principal of the Brock Street School at Whitby. 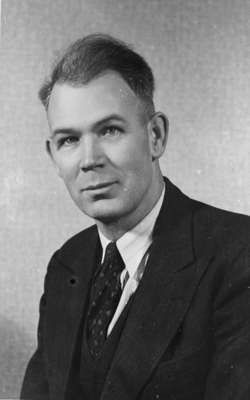 He taught at Dundas Street School from 1932-1942 and was principal for 10 years. He was elected to council from 1947-1949 and was mayor in 1950 and from 1952-1959. From 1961-1963 he was a Justice of the Peace and from 1963-1974 he was a Deputy Magistrate, Magistrate and Provincial Court Judge. Mr. Jermyn was Chairman of the Board of Governors of the Dr. J. O. Ruddy General Hospital from 1982-1984. He died at Bowmanville on January 21, 2002 and is buried at Groveside Cemetery, Brooklin. Harry Warburton Jermyn, January 19, 1948, Marjorie Ruddy. Whitby Archives 31-002-032.